Detailed, constructive and polite feedback in reviews is valuable input for our online review community, including the businesses reviewed. A good review includes enough detail to give others a feel for what happened. Explain which factors contributed to your positive, negative or just so-so experience. You might also offer your view on what the company is doing well, and how they can improve. But keep things friendly and courteous! Increase the relevance of your review by addressing your overall experience, including the level of customer service you received. Tell people how helpful the company was! Focusing on only one element, such as product quality or delivery options, provides limited insight to readers. There’s no rule against only writing a handful of words in a review, but the more specific you can be, the more likely the review is to be useful. We suggest writing from your own individual perspective, keeping it honest and sticking to the facts. Help readers stand in your shoes. We understand that it can be tempting to highlight exceptionally good or poor customer service by naming the person who served you. But adherence to privacy laws on Trustpilot is important, so we suggest keeping your review general, and writing directly to the company to praise or complain about specific employees. We don’t moderate or censor reviews before they’re posted because we trust that the majority of our users have good intentions. But publishing a review online means it’s public. 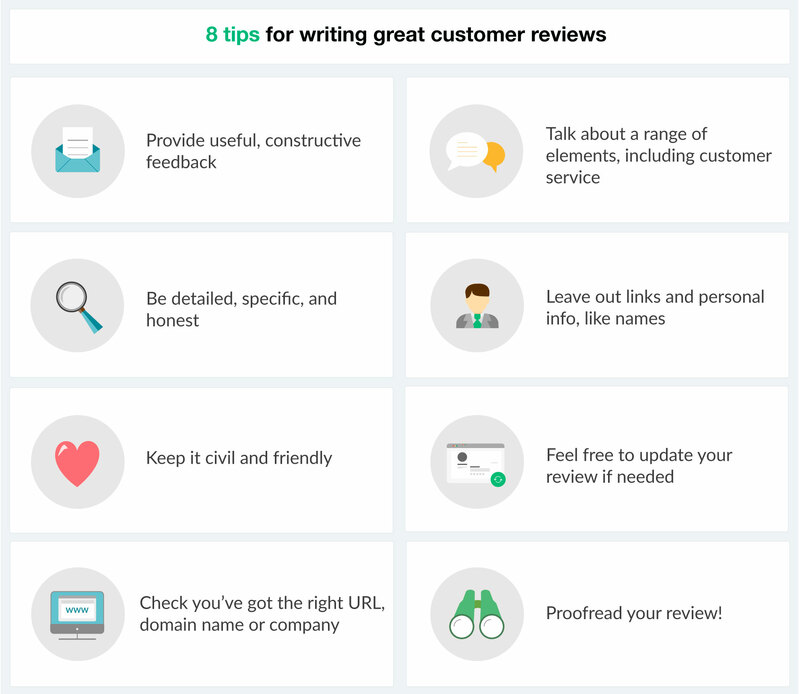 Therefore, the same kinds of rules apply to customer reviews as to any kind of published opinion. Freedom of speech gives you the right to express yourself, but there’s a line between appropriate and inappropriate. At the extreme end, the law prohibits defamatory statements. This includes accusatory statements that are untrue or not yet proven to be true. If you’ve had a negative experience, instead of pointing an angry finger, a more credible approach is to adopt a calm, sober tone. Simply explain what took place and leave it to readers of your review to draw their own conclusions. This might also mean that the company in question will be more willing to engage with you to address the problem. An important feature on Trustpilot is that you can edit your review to reflect a changed opinion or a resolved problem, or write a new review if you have a new or updated experience with the same company. For sign-up services that continue over a period of time, you can edit your review as the relationship evolves to reflect the unfolding experience. We do allow companies to invite their customers to review them immediately after signing up. However, in some cases, it can make sense for users to later return and edit their review to reflect a more complete picture of their overall experience, or a changed opinion. Check that you’re posting your review in the right place. If a company has claimed their profile on Trustpilot, there’s often information about that business on the right-hand side of the profile page that can help you check whether this is the business you’re intending to review. Trustpilot is a platform that companies can access for free. Reviews are public, but that doesn’t guarantee that the reviewed company will see your feedback. If you have an urgent problem, you should contact the company directly. 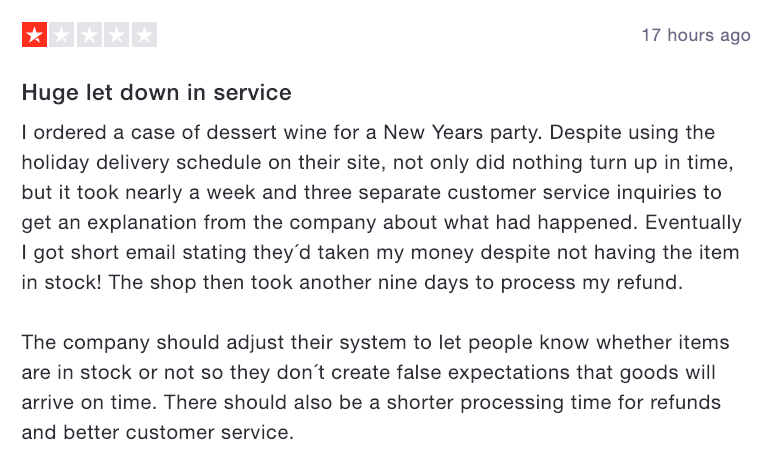 Please also remember that Trustpilot’s role is not to resolve disputes between reviewers and businesses. However, if you choose to write a review on Trustpilot, the company in question may see your feedback and engage with you. And other users who read your review will be able to learn from your experiences. It's a good idea to check that your review is readable, makes sense and has no typos before posting, but a surprising number of reviews contain errors. So remember to quickly run your eye over your text before hitting "post”!